Macau – August 18, 2013 –It was an incredible weekend of thrills, spills and world firsts in Macau, with two heart-stopping shows performed at The Venetian® Macau’s Cotai Arena. Thousands of local fans packed into the arena for their chance to witnessthe world’s greatest action sports spectacle, Nitro Circus Live (www.nitrocircuslive.com), performing in Asia for the first time. The tour showcased over 40 ofthe world’s best action sports athletes performing daring and record-breakingtricksin freestyle motocross, BMX and skateboarding, along with heart-stopping stunts onan array of contraptions launched off Nitro Circus Live’s multi-million dollar set and famous 50-ft. high Nitro Gigant-A-Ramp. In an incredible world first, the two hottest FMX riders on the planet, Taka Higashinoand Adam Jones,who recently took out first and second in FMX Freestyle at X Games LA, performed unbelievable side-by-side double grab backflips. The trick is one of the toughest in the sport and Taka and Adam are two of only a handful of ridersthrowing it down, let alone perfectly synchronized with only mere feet between them. “We have an insane group of athletes who push each other to new extremes every single show and to have the two best FMX riders in the world perform the world’s first side-by-side double grab backflips in a Nitro show, was really special.” said Porra. Showing the crowd why he is the world’s best, Taka also performed the rock-solid backflip; the first time the stunt has ever been performed in a Nitro Circus Live show. The jaw-dropping trick involved Takaflying upside-down, releasing the handle bars and grabbing the seat, and then releasing his hands from the bike completely, while upside down. He then must find the bike and pull himself back on. But the loudest cheer of the night went to extreme wheelchair athlete, Aaron‘Wheelz’ Fotheringham, who performed the first everfrontflipin a wheelchair over a 40-foot gap. The crowd leapt to their feet as Wheelz hurled himself down the Gigant-A-Ramp with pyrotechnic flames and landed with textbook accuracy. To top it off, the live show also featured the spectacular choreographed ‘Nitro Bomb’ with 18riders back-flipping in the air simultaneously. With demand for the tour at an all time high and off the back of the highly successful 2012 European tour, the Nitro crew will take a short break before heading overseas to perform for European fans once again. 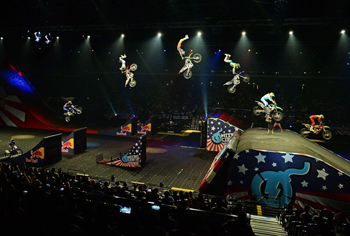 For the first time in Nitro Circus Live history, the tour will also head to North America to perform a series of shows in January, 2014. For more information, tour updates and behind-the-scenes content, visit www.nitrocircuslive.com. 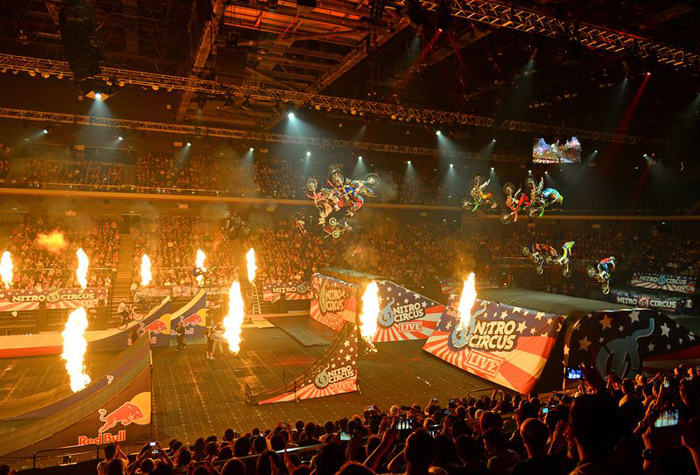 Follow Nitro Circus Live on Twitter: @nitrocircuslive and Facebook: www.facebook.com/NitroCircus.